When it comes to AMOLED technology, Samsung has pretty much been the industry leader for quite a few years now. Top notch displays have been gracing the company's flagships for generations and the new Galaxy S8 pair does live up to that reputation. The industry is shifting to new ultra-wide screens but the transition will inevitably take some time. Apps and games are one thing, Android can scale those so no big deal. Media content, on the other hand, will either take years to adapt to the new format or won't do it at all. Either way prepare to see a lot of black bars around your videos or photos or live with some stretching or cropping. It's not all bad - the new format is better for watching movies and their trailers as they come in the even wider 21:9 format. Netflix is making a push in that direction as well. And even viewing older sources, living with letterboxing isn't really all that bad, since, at the end of the day you are still getting more usable space than on the Galaxy S7 edge. The only real difference being that bezels can't magically turn into extra screen real estate when needed, while the S8 and S8+ effectively offer an alternative that can. Speaking of streaming services and new content standards, HDR is quickly becoming the buzzword. We get it, if we are really going through with this wide aspect revolution, then we might as well get all the extra colors and contrast along with that. The Galaxy S8 and S8+ support the HDR10 standard, but not Dolby Vision, which the LG G6 has. However, the HDR situation is currently a bit more complicated than that. Samsung's new Infinity Display panel holds the UHD Alliance's "Mobile HDR Premium" certification - it is the first smartphone display to get it. It got there through a combination of 113% coverage of DCI-P3 and 142% of the sRGB color spaces, impressive levels of brightness and contrast ratios DisplayMate recently gave the S8 panel its highest ever "A+" rating, so it should be perfectly well prepared for HDR, regardless of formal certification. Amazon has promised to adjust its system to accommodate the Galaxy S8 pair and the G6 soon, so they can benefit from the HDR part of the higher-res sources. This is what we meant when we mentioned early-adopter hurdles. 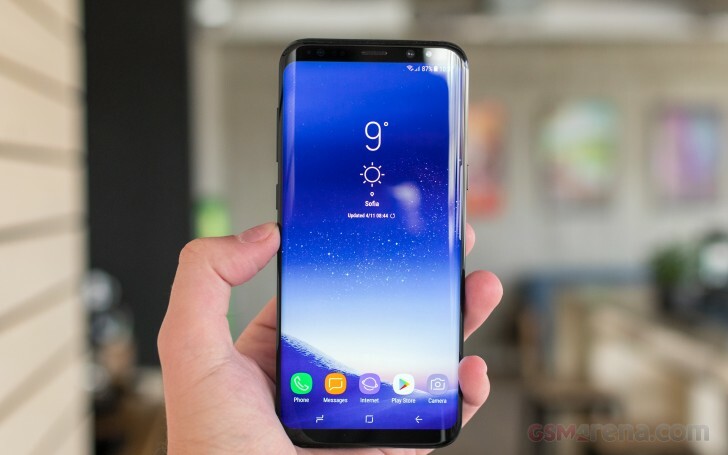 Both devices have the same screen resolution and given the size difference, it is only natural that the 6.2-inch Galaxy S8+ has a lower 529ppi, compared to 570ppi on the regular S8. Both numbers are a bit lower than last year's S7 edge and S7, respectively. However, the difference is really negligible and the S8+ is as sharp as you'd need. It is also worth mentioning that Samsung runs the display at 2220 x 1080 pixels by default. This is something the company introduced in hopes to improve battery life on its devices. Of course, you can always put the S8+ on its native 2960 x 1440 pixel resolution, or even go down to 1480 x 720. Things do look noticeably fuzzy on the latter. On a sub-pixel level, Samsung employs a setup it calls Diamond Pixels. It has a few key characteristics: First, the Red, Green and Blue pixels are all different sizes. The Blue is the largest, since it has the lowest light emitting capacity. Then comes Red and the noticeably smaller Green. Shape is also different. In order to maximize sub-pixel rendering, the first two are shaped like diamonds, while Green is oval and squished in between. The 45-degree symmetry of the arrangement should prevent aliasing and artifacts in drawing straight and diagonal lines on the Pentile display. It is worth mentioning that our standard color tests all measure color accuracy compared to the sRGB color space. By that standard, our unit managed an average deltaE of 3 and a maximum one of 5.6, using the AMOLED Basic mode. This is a bit worse than last year's Galaxy S7, but there is more to be said here about the color mode options. Speaking of, brightness on the Galaxy S8+ is exceptional. We managed to measure a whopping 870 nits in our tests. DisplayMate claims an even more astounding peak of 1,020 nits. That has to be a record right there. Still, it is worth noting that this was achieved in a very precisely controlled environment, not really applicable to real-world use. As far as real-word usable numbers go, the S8+ tops out somewhere around 647 nits. This is still a pretty impressive result. And, in case you are wondering where the variance comes from: OLED brightness is dependent on the percentage of the screen being lit up. We thus got the 870 nits score from a very small white rectangle. 647 nits is what you can realistically expect when using the entire screen. For the sake of fair comparisons, we've stuck to the usual APL (average picture level) we've used in the past. Since this is an AMOLED panel, contrast is practically infinite. Minimum white luminance is also nicely low at 3.30 nits so you won't be blinded if you operate the phone in complete darkness. The Galaxy S8+ also manages all this picture quality, while maintaining a very low level of reflectivity. Naturally, combined with the high brightness, this helps deliver excellent sunlight legibility. The Galaxy S8+ is nothing short of a chart-topper in this respect. It even comes close to the all-time champ, the Nokia 808 PureView. It should hardly come as a surprise that Samsung treated its latest flagship offers to a full set of connectivity options - and cutting edge at that. The Galaxy S8 and S8+ are the first phones to launch with 1gb LTE, thanks to the Snapdragon 835 and Exynos 8895 chipsets. That is LTE-A (4CA) Cat16 1024/150 Mbps. Yes, both chips are not only very close performance-wise, but should be equally capable of sustaining blazing fast network speeds, if your carrier supports them. It's also worth noting that the Exynos 8895 version supports 5 carrier aggregation, while its Qualcomm counterpart has to get by with 4. In practice, you likely won't be able to reach that high any time soon, so we wouldn't fret over it too much. In keeping with Samsung's typical marketing, there are both single and dual SIM versions of the S8+ out there. Unlike with recent Galaxy A models, there is only one tray on the S8+ with a dedicated nano SIM slot, along with a hybrid one. This could, potentially, be a problem for anyone that doesn't trust the cloud and still has high storage requirements, since 64GB is the norm in this generation. In terms of local connectivity, you get dual-band Wi-Fi 802.11 a/b/g/n/ac, MU-MIMO (1024-QAM modulation mode with 25% higher data rate over the standard 256-QAM), as well as the up-to-date Bluetooth v5.0, with support for A2DP, LE, aptX and ANT+. The Bluetooth radio has one particularly neat trick up its sleeve - it can connect to two audio devices at the same time and output to both simultaneously. The feature works decently, but perfect sync is not really feasible. You could potentially make it work for a quick and dirty multi-room solution, but sync becomes an even bigger issue than with two sets of headphones. NFC is a given and so is Samsung's proprietary MST technology for card payments in supported markets. Of course, the list gets even longer if you decide to count sensors, of which the S8+ has quite a few: Iris scanner, fingerprint, accelerometer, gyro, proximity, compass, barometer, heart rate, SpO2. There is a full stack of location services supported as well: GPS, Galileo, Glonass and BeiDou. 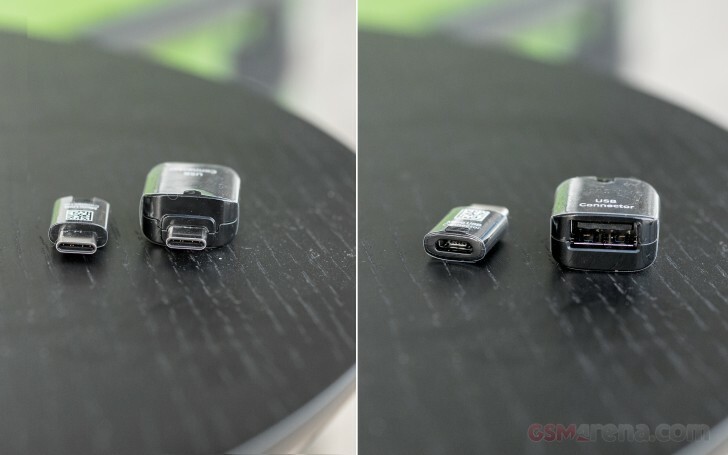 Like we said, Samsung has now officially taken the plunge to USB Type-C. In the case of the Galaxy S8 and S8+, there are a few special things about the port. It houses a USB 3.1 connection, which means theoretical data transfer speeds of up to 10 Gbit/s. However, the real icing on the cake lies in the phone's support for outputting video - an increasingly rare feature, even among flagships. Official information is patchy, but going by existing standards, this should mean the S8+ outputs video through DisplayPort 1.3. In theory, this should allow for video output up to a whopping 4K@120Hz or even 5K@60Hz and 8k@30Hz. However, the official standard is one thing and real-world support is another. In practice, you have the option of using DeX for video out. Samsung is trying its best not to advertise any of this too openly, but the DeX only actually outputs at 4K if you use it to mirror your device screen. The actual desktop UI gets rendered in 1080p@60Hz. Luckily, if a proper 4K@60Hz stream is what you are after, Samsung does already offer an official USB-C to HDMI 2.0 adapter for the S8 and S8+. It will set you back $49.99 and sounds like a better idea if multimedia is all you are after and you don't really mind skipping on the new desktop UI. You can read more about DeX in the dedicated chapter. Before we round things up with the port, there are those two little adapters in the bundle that we mentioned earlier in the unboxing chapter. They have a lot to do with transitioning away from the older micro USB standard and towards Type-C. The big adapter lets you connect any USB accessory with the new port. Since the S8+ supports USB Host, an older Type-A thumb drive would be the most obvious choice. You can even connect your old phone and have the Galaxy S8+ transfer all information when you set it up. The micro USB adapter is more for convenience - it allows you to use a regular micro USB cable or charger with the S8+. It doesn't have USB host functionality unlike the bigger adapter. MirrorLink is also part of the S8+ mix. If you have already invested in something like a compatible car entertainment system, the phone upgrade won't break your setup. 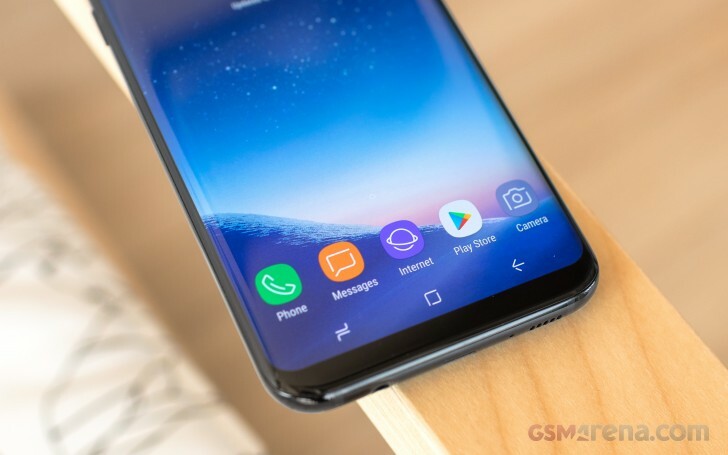 Of course, beyond wired connectivity, the S8+ has its Smart View interface to support an assortment of wireless display sharing protocols, including Miracast and Google's proprietary Chromecast. Finally, in case FM radio is your thing, the Galaxy S8+ will let you down - it has no receiver on board. Size aside, few things actually set the Galaxy S8 and S8+ apart. In fact, the battery is the only other major difference. The Galaxy S8+ packs a non-removable 3,500mAh battery, a good 500mAh more than the regular S8. Since the Note7 misfortune, Samsung has delivered plenty of evidence that it has boosted quality control to make sure the issue never repeats itself. The Galaxy S8+ managed a solid 88 hours in our regular battery test routine. Overall, this falls in line with what we expected, considering the endurance of last year's S7 edge and the S8+ hardware differences. The new screen has both a larger surface area and more pixels than the predecessor and the S8+ still managed to last over an hour more than the S7 edge in Wi-Fi browsing and 45 minutes during video playback. To be fair, our test clip is in 16:9, so the rest of the phone's pixels were essentially off during our runs. A lot of this improvement could be attributed to polished software. However, we can't fail to acknowledge the new and efficient 10nm manufacturing process in both the Exynos 8895 and Snapdragon 835 chips. On the other hand, 3G talk time and standby are both a bit lower compared to the S7 edge. The latter could partly be explained with the extra load of Bixby running in the background. All of the posted results were achieved through testing at the phone’s native QHD+ resolution. Battery percentage data was recorded programmatically straight from the handset, to ensure the highest possible level of precision. For the sake of thoroughness, we ran the tests in 2220 x 1080 pixels and 1480 x 720 pixels modes as well. The minor differences we recorded were in the minutes, and are well within the margin of error of the tests. Perhaps an alternative usage pattern might lead to some meaningful advantages of going low-res, but our experience doesn't point in that direction. One such potential scenario is gaming, but then again you already had the option to limit resolution within Game launcher. This falls in line with what we observed while re-testing last year’s Galaxy S7 and S7 edge flagships after the Android Nougat update introduced variable resolution. The Always On display feature was always going to be a battery drainer, no two ways about it. Samsung's claim that it would cost you 1% per hour seems about right and it does leave a huge impact on the overall endurance rating. All of these numbers were achieved using the international Exynos 8895 version of the S8+. We would love to put the Snapdragon 835 variant through its paces as well but, in honesty, we don't expect any major differences. Samsung is still sticking with its Adaptive Fast Charging solution. Frankly, it does a good job topping the 3,500mAh battery in about 90 minutes. There is also support for Qualcomm's Quick Charge 2.0. 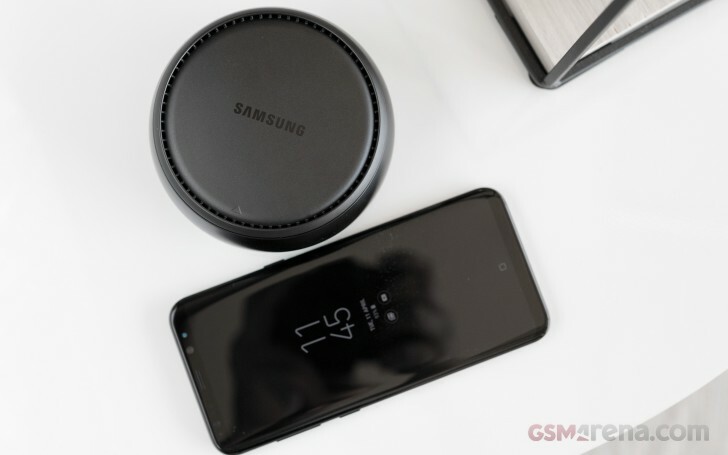 Much like the company's last-year flagships, the Galaxy S8+ is also capable of wireless charging compliant with both WPC (Qi) and PMA. 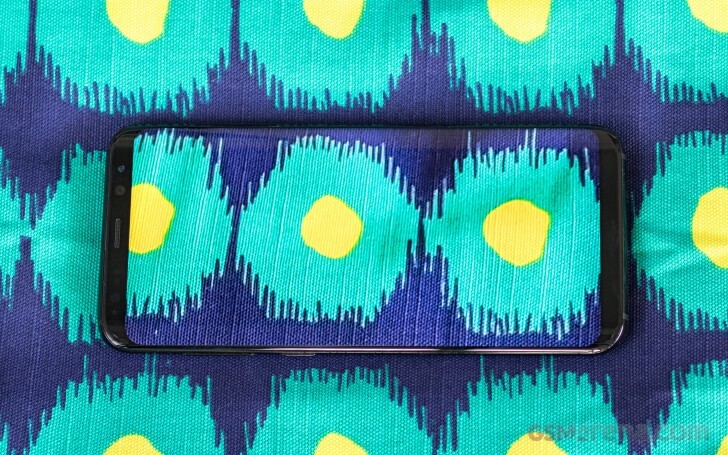 Samsung will also sell you a fast wireless charging pad, which can fill up the battery nearly as fast as cable.